Get yourself bronzed and beautiful with one of our tanning treatments. Fake it with either our Clarins top to toe applied tan, or jump in our St Tropez spray tan booth where one of our therapists will spray your body with your chosen St Tropez mists. If you fancy a lay down on a tropical beach for a short while, try our lay down sunbed, a gentle way of tanning and a good way to prepare your skin for a holiday. Using Clarins products that contain plant extracts, your body is gently exfoliated and moisturised. The Clarins self tan is then applied to leave you with an all over natural golden tan which develops within 3-4 hours. Airbrushed tanning is the fastest way to a perfect instant tan, leaving you with a streak free and natural looking bronzed colour. Ideal for parties and special occasions! To get the best result, we ask that you exfoliate before you come for your appointment and wear loose dark clothing. This top-to-toe tan will develop in 8 hours. We offer a variety of tanning mists to suit your needs. Ask your therapist what tan will be best for you. Come to use our lie down sun bed and relax in the sunshine! 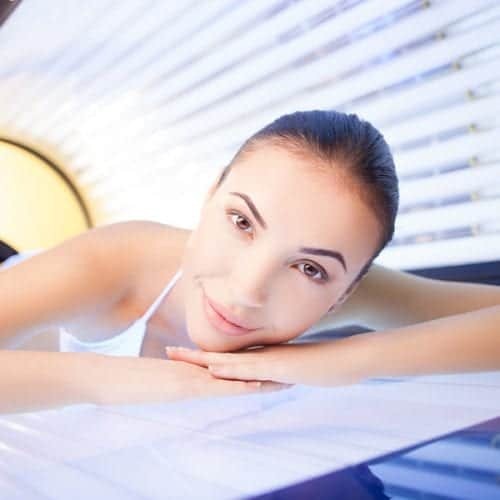 We have a “lay-down” sun bed available for which we offer sessions of 5,10 or 15 minutes at a time (length of session will depend on your skin’s sensitivity).